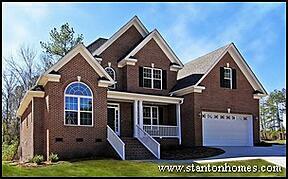 Need help deciding if a front entry garage is right for your North Carolina custom home? Here are some of the pros and cons of a front facing garage, to help you decide. Why should you choose a front entry garage floor plan? - Front exterior can be dressed up with specialty garage doors (such as a carriage style) , stone or brick accents, decorative glass, light mountings and more. - Front entries require less driveway square footage (which means a lower cost in materials and labor). - Front entry garage homes can generally fit on smaller lots. - Homes with front entry garages usually don't have windows in the garage, which can save some cost. Why shouldn't you choose a front entry garage floor plan? - The neighborhood in which you want to build may not allow a front entry garage. 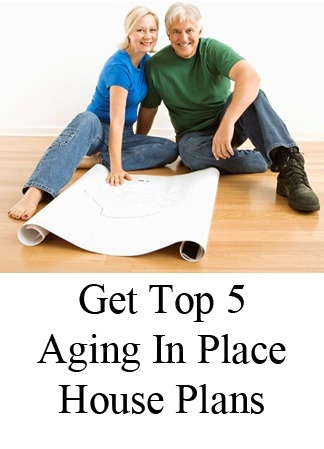 - Some homebuyers prefer the garage to be completely out of sight. - The home may have a less "polished" exterior, with prominent garage doors and fewer windows. Prefer a front entry garage? Raleigh front entry garage home plans are available in a wide range of square feet, with one and two story options. 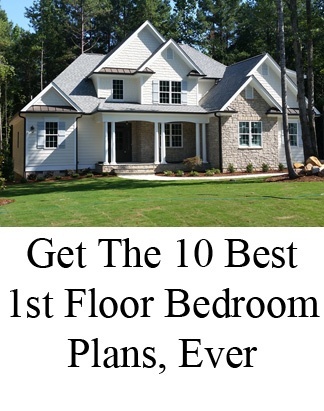 Browse floor plan options here. Have a floor plan you love, but want to convert it into a front-facing garage home, or need a front entry garage because of your lot restrictions? 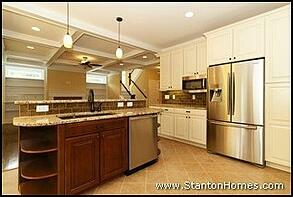 No two Stanton Homes are the same. Our design team expands your options to fit your lifestyle with a look and feel you’ll love. 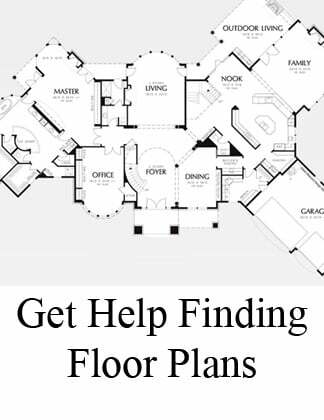 Ask us about design/build options or get help finding a floor plan. Wondering what kind of garage style is best for your Raleigh custom home? Here are the pros and cons of choosing a Courtyard Style garage. Why should you choose a courtyard entry garage floor plan? 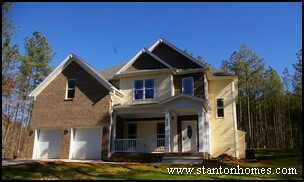 Watch a video tour of the home pictured here - The Worthington. Why shouldn't you choose a courtyard entry garage floor plan? - Courtyard garages may require extra care in choosing a lot to allow for a deeper home foundation. A courtyard garage home can be extremely attractive - and it's just a quick hop from the driveway to the front door. Courtyard entry garage home plans are available in a wide range of square feet, with one and two story options. 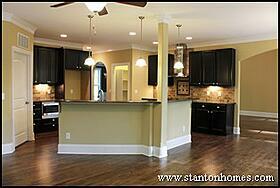 Browse Floor Plans - Custom Homes in Raleigh. Have a floor plan you love, but want to add a courtyard garage? 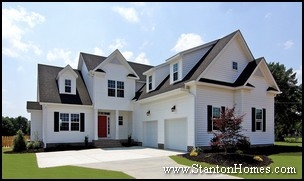 No two Stanton Homes are the same. Our design team expands your options to fit your lifestyle with a look and feel you’ll love. 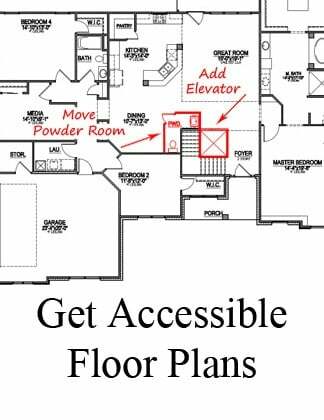 Ask us about design/build options or get help finding a floor plan. Front Entry Garage Homes - Why Choose a Front Entry Garage? How much does a detached garage cost? You can save money and build your new home the way you want it - by adding some of the final details later. Why some things need to be upgraded now: Some features will cost a lot more later. Others might be impossible without totally ripping the house apart to make structural changes. How some options can be upgraded later: With proper planning, homes can be constructed so that additional features can be added or changed later - as long as they don't involve structural changes, and the floor plan allows enough space. The two most common kinds of flooring in the Laundry Room are ceramic tile or vinyl flooring. Consider the kinds of flooring closest to this room - you'll want to coordinate with the feel of the surrounding rooms. 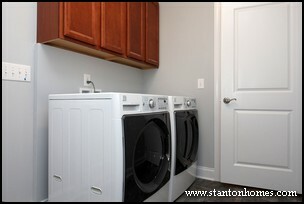 A laundry room is usually on the smaller side, ranging anywhere from 6'x8' to 8'x10', in most homes. Thus you'll likely have somewhere between 48 and 80 square feet of flooring surface, plus any "waste factor" that must be added for material cuts. So it might be a little easier to "splurge" on an upgraded or unique tile in this room, but you might also want to consider upgrading your guest bath instead. Not all builders offer cabinets over the washer/dryer - it' s fairly common to just see a ventilated wire shelf here. Cabinets over the washer and dryer can be great for storage of cleaning supplies, paper goods, and other household items. If you're planning to add cabinets later, make sure the wall space will accommodate a standard cabinet size - a semi-custom or stock cabinet is a lot less expensive than something custom-built for the space. For a larger laundry room, you may want to consider additional storage. 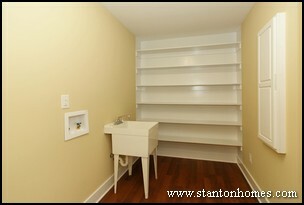 A closet can be less expensive than a full height furniture grade utility cabinet, and can offer more storage options. A closet that's large enough for both a full set of shelves AND the vacuum, brooms, and other tall items can be very handy. Find out if your builder provides gas or electric hook ups for the dryer. If you already have appliances, it could be expensive to add the "alternate" hook up later. Be sure to specify which kind of hook ups you require. Generally, the washer goes on the left and the dryer on the right. Your builder should have the washer and dryer hookups prepared for this. 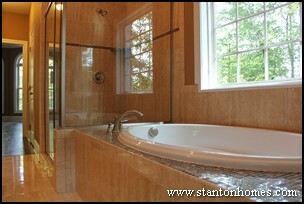 If you prefer something different, let the builder know at rough-in stage, as it can be expensive to change this later. For the appliances themselves, consider Energy Star labeled and front-loading, water saving washers. There have been significant advances in both washers and dryers over the past couple of years, and the utility and water savings really add up over time. 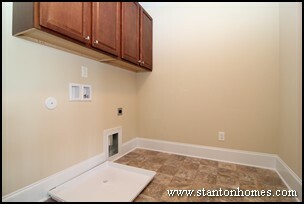 Laundry sinks can be convenient, especially if the laund ry room is right off the garage. If you're even considering adding one later, ask your builder to "rough plumb" to the laundry room, so that you don't have to open the walls later to have a plumber add an extension to the laundry room. A free-standing laundry sink is much more cost effective than a cabinet/countertop/sink combination, and you can always add a full cabinetry package later, as long as the "guts" are in place. 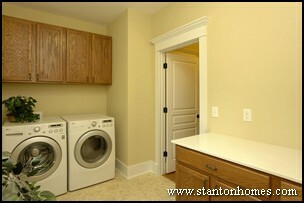 Larger laundry rooms can include a "mudroom" concept. Built in storage can be handy and appealing, and "drop zones" can be custom designed or purchased through cabinetry companies. If the budget is tight upfront, talk to the builder about creating a wall or alcove space that can accommodate a standard size locker set, which you can personally add later. A 4 foot or 6 foot section of wall can be planned for future inclusion of shoe racks, storage cubbys, coat hooks, and much more. 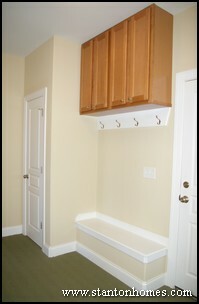 Learn more about mudrooms, what they are used for, and what they can include here. Ask your builder if they will allow you to take a second look at all your choices before making a final decision, and make sure they walk through each one of these features and any others you're considering so you know just what you're paying for - and what you really don't need to come up with until later. Do Stainless Steel Appliances Cost Too Much? Kitchens with islands, when designed correctly, offer more counter space, additional storage room, and a convenient place to tuck appliances. What's not to love? How big is the island, compared to the rest of the kitchen? Remember the difference between an island and a peninsula, and the pros and cons of each, based on kitchen size. How open will your kitchen be, and what do you want the island to look out to? 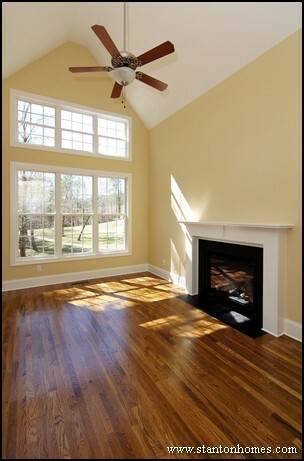 A great room with lots of windows and a fireplace so you can have a cozy conversation with family and friends? A living room with a TV so you can watch the game while working? Is there enough room left over in the kitchen for everyone to easily navigate the island? While islands provide plenty of counter and storage space, they also take up floor space. Do you want to include an eating bar with seating? Island height and position can effect seating area possibilities. 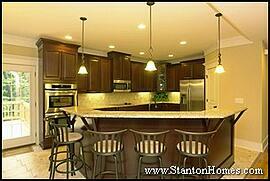 It's recommended that you have a 10-12 inch difference between the island countertop and stool height. For example, a 42" island works best with a 30" stool. 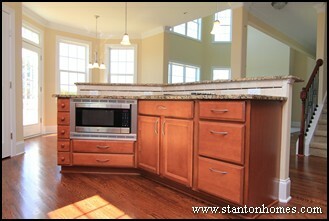 Do you want the island to contain a sink, dishwasher, range, trash bin, or microwave? Keep in mind - efficient working space requires easy access to the refrigerator, sink, and cooking range. BUT, it's best to separate these three items into a "work triangle" for greater efficiency and ease of movement. 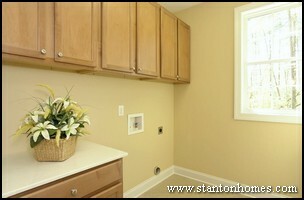 Plan ahead - ask your builder where to add electrical outlets into the island, and include plenty of them. Don't try to stretch cords across a walk way! Do New Homes Have More Windows? NC Custom Home Builder Tips - How Many Windows Should my New Home Have? What are the pros and cons of adding more windows? Here are some pros and cons of adding lots more windows to your new home, or choosing a floor plan with many more windows than average. Click here for a short guide on popular custom home window styles. Many (but not all) custom home builders will allow you to change window sizes. Even widening or lengthening an existing window may give you the light you're looking for. "Specialty" windows are much more costly than standard windows. Arches, half rounds, and huge picture windows have a lot of appeal - but you'll want to make sure this is something you can raise the budget for. Consider adding additional windows first to the rooms you'll be spending the most time in, like the Great Room. Two or three windows is probably more than sufficient for each bedroom, where you'll spend most of your time in the evenings. Look at rooms that don't have any windows. Redesigning the kitchen to add a single window over the sink may make a huge difference in the natural light in the room. Consider a sliding glass patio door in place of a single window and French door. You'll add much more light. Ask your NC custom home builder what they think of the existing window sizes and placement - with years of experience, a good builder will be able to suggest some good solutions! Open Concept Floor Plans – What does an “open floor plan” look like? Are Kitchen Islands Going Out of Style?